10,102… that’s the number of meteors detected by my 2 camera systems since the start of observations in late February 2008 till the end of 2009. It’s amazing how quickly the numbers add up. The high number is a testament to the clear dark sky over Tucson. Over all of 2009, I was able to detect meteors on 287 nights. That number could even have been higher if not for a few weeks when the cameras were left off. Hopefully I’ll be able to break 300 nights this year, though our active El Nino winter is resulting in a slow start. My systems (as well as Bob’s) are part of an international group of video meteor observers using Sirko Molau’s MetRec meteor detection software. Last year this group, the IMO Video Meteor Network, consisted of 24 observers from 10 countries operating 43 camera systems. Every month Sirko publishes a summary of the previous month’s observations while the December summary also presents statistics on the entire year’s data. The IMO Video Meteor Network monthly summaries can be found here. Personally, I find them a great read and can’t wait for their release. Sirko does great work and the network would never have happened without him. Thanks, Sirko! Below is a table breaking down my results by month. Nights, hours and meteors per month are listed. 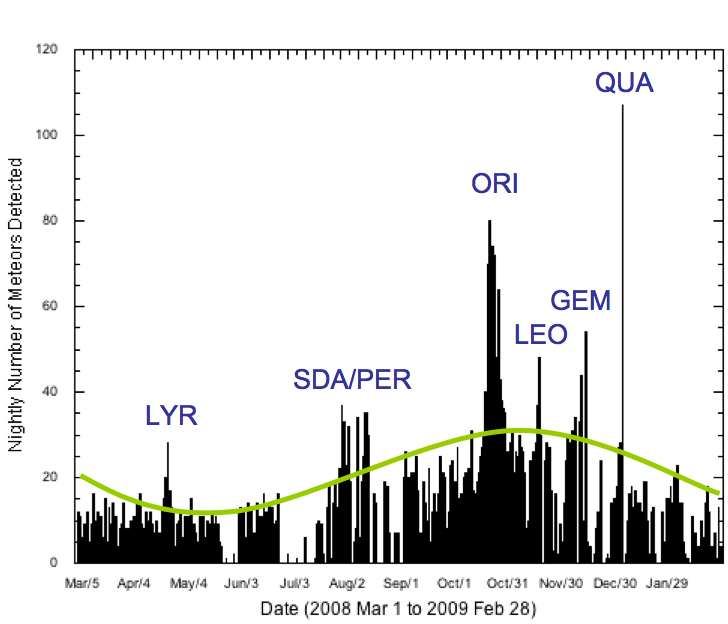 Even further down is a graph of nightly detections covering an entire year from March 2008 to February 2009. During this time only a single camera was used and for the most part, very little was changed. The camera, lens, position on the sky and MetRec code parameters were constant giving an accurate measure of the variation in meteor activity throughout the year. Note the weather has not been accounted for and results in low rates for some nights such as the monsoon months of July and August. Rather than looking like 5th or 6th best shower, the Perseids (PER) should be the best shower of the year. Also notice the rather broad maximum for the Orionids (ORI) versus the very short maximum of the Quadrantids (QUA). Other showers highlighted on the plot are the Lyrids (LYR), Southern Delta Aquariids (SDA), Leonids (LEO) and Geminids (GEM). Very impressive Carl. I look forward to the continued success of this network!